Call me a trend-setter. No, maybe not. I can’t see an obscure Italian needlelace muscling its way past knitting, crochet, and quilting. Recently someone posted a comment on one of my Flickr photos asking whether I knew of a source for instructions in Puncetto Valsesiano in English. To my surprise, there isn’t a lot available, apart from the 500 page Anchor Manual of Needlework , which costs a fortune to ship to a place like Israel. 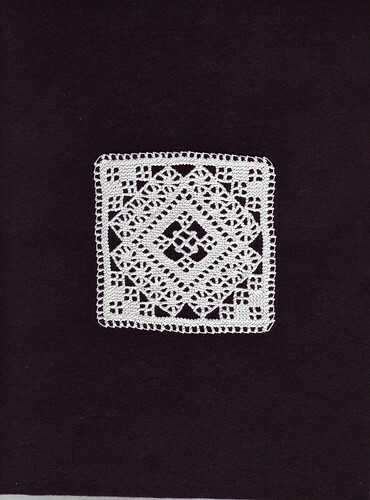 Puncetto Valsesiano is a knotted needlelace from the Valsesia region of Italy, in the Piedmont. It is worked with only a needle and thread. 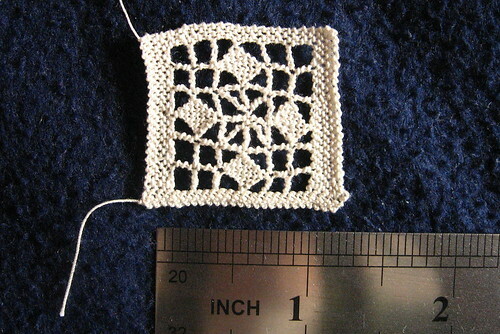 Unlike many other forms of needlelace, the patterns tend to be strictly geometric. If you’re wondering what Puncetto looks like, check out this video. 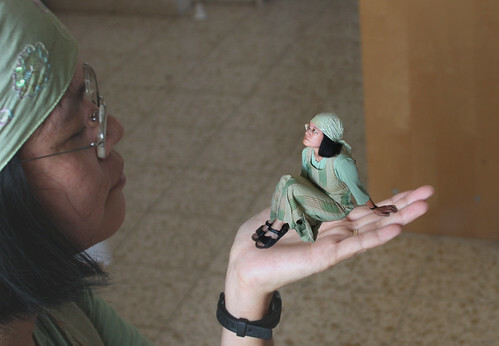 I’m blown away by the yardage that this woman has produced with only a needle and thread. If you’re a newcomer to needlelace, Puncetto is one of the less demanding forms for beginners because it doesn’t require as careful tensioning as the buttonhole stitch-based lace. (I also confess that I never have the patience to couch the tracing thread to a backing.) You can teach yourself from the video but it’s easier from pictures or diagrams. I’ve photographed the steps for making the stitch and will post them another day. This is just an introduction. One note: I’m not an expert! I taught myself from diagrams with advice from other needleworkers, like Marina, whom I met on the Internet. It was copied from one I saw in the video, in the screenshot below. I didn’t make the sketch clear enough, so I forgot to fill in some of the squares. I later started a corrected version. Honestly, I’m not sure I ever finished this attempt! Most of the information about this lace on the Web is aimed at tourists. 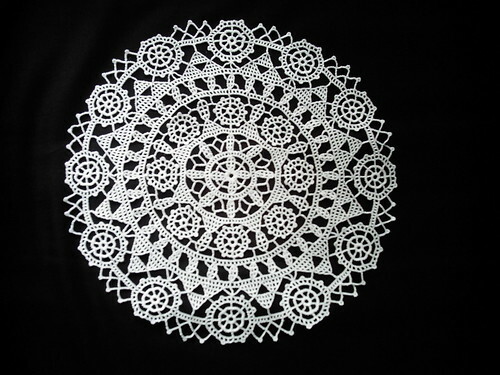 Some lovely examples are shown on this lace blog, Con Nuestras Manos (“With Our Hands”). Very few people do this kind of work. Marina may be one of the only ones. Her work is exquisite. 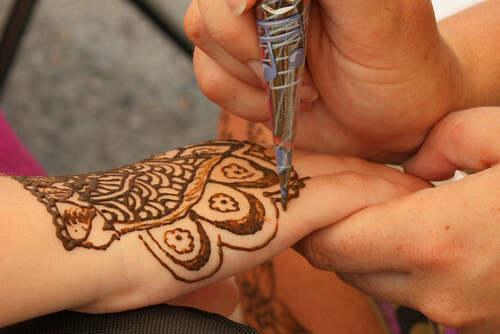 She gave me a lot of advice when I was struggling with the stitches, especially the tipped square or diamond shape. What a great planter! It was on the sidewalk outside a small cafe. 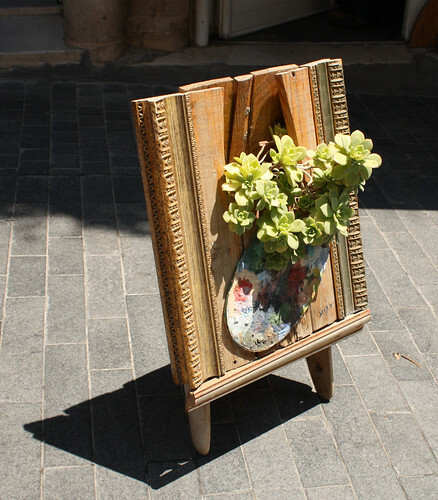 It is designed to look like a framed painting of a plant in a vase on an easel, with a real plant sticking out. 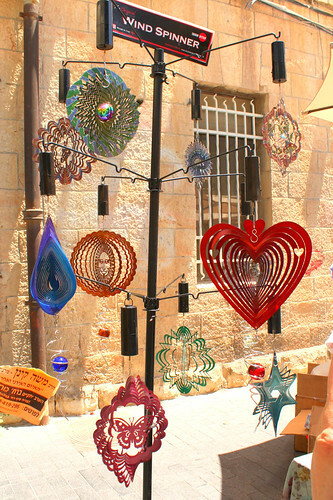 Last Friday I finally managed to visit the Bezalel Art Fair in downtown Jerusalem. 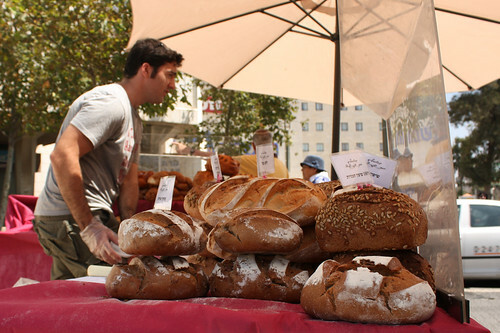 The fair started in April, 2010, and seems to be an ongoing event, at least through the summer. It’s held on Fridays at three locations close to King George. 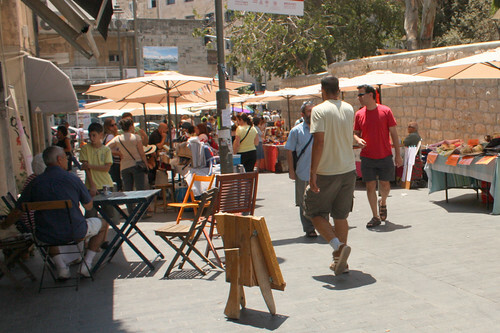 It’s very similar to the Nahalat Binyamin craft market in Tel Aviv, but much smaller and less crowded. The quality of the merchandise was very high and I noticed quite a few English-speaking vendors. I really enjoy chatting with creative people! There were baked goods, jewelry, clothing, bags (including beautiful little suede bags for 60 NIS, nicely finished inside, in colours like pink, powder blue, violet), some amazing hair clips made from real food (the artist was annoyed when I took a photo, so I won’t post it), books, photos, Judaica, mobiles, and a henna artist. 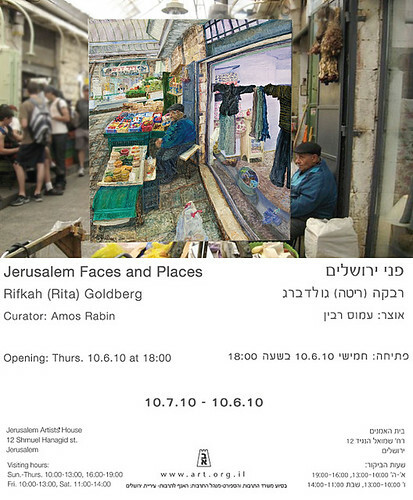 If you’re looking for something to do on a Friday morning and you’re in the Jerusalem area, it’s a nice way to spend a couple hours. If you’re hungry, CafeCafe is nearby and it’s kosher. Photographer Julia Schiller from Wisconsin. 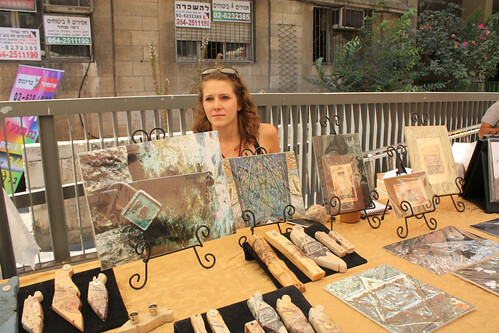 She uses an emulsion technique to apply photos to mezuzah cases and metal plaques. I spent last Shabbat in Efrat with some of my husband’s oldest friends. 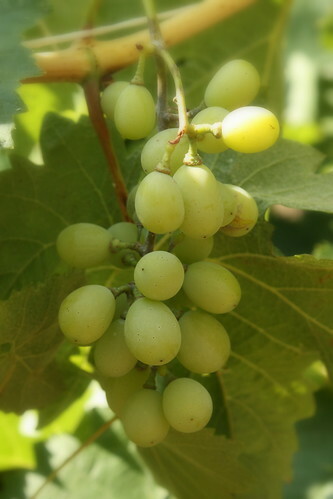 This photo of grapes was taken in their garden. Why am I shiny and covered with sweat? Because I had set up the tripod and was trying to take these photos in my livingroom 5 minutes before I had to catch the bus to work. It’s not a very inspired example but I’m satisfied with it as a trial run. I was inspired by Amber and Funky Slug’s mini clone work. Thanks, Amber, for the tips! Amber has some great mini clone photos. Funky Slug is in the 8th photo. They’ve never met in person, just collaborated while sitting or standing on her laptop. Here are Funky Slug’s mini Amber & Slug photos. This one’s my favourite. A couple weeks ago I saw the biggest Chinese cabbage that I’ve seen years, and it was in our local minimarket. Faster than you can say “kimchee craving,” I bought the head for a mere 5 shekels. Now I’m sorry I didn’t photograph the cabbage before I cut it up. I did remember to photograph it just after I “put up” kimchee, before it starts to look like swamp-in-a-jar. And here’s the recipe, adapted from Madhur Jaffrey’s apparently out-of-print book, Eastern Vegetarian Cooking . Wash and slice the cabbage into 3/4″ pieces. Dissolve the salt in 1 1/2 liters of water. Pour over the cabbage in a large bowl. There should be enough salt water to cover. If you need more liquid, dissolve 1 tbs salt in .5 liter water and add. Weight down with a glass plate and a cup. Leave for 12 hours, turning the cabbage occasionally. The cabbage will gradually wilt, so that the liquid covers the cabbage. Put the ginger, garlic, cayenne pepper, and sugar in another large bowl. Mix well. 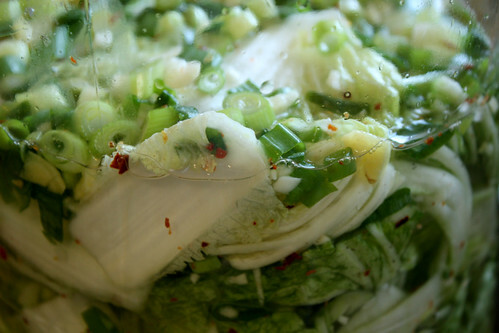 Put this cabbage mixture into a 2 liter jar or crock. Pour enough salt water over it to cover the cabbage, leaving 1 inch of empty space at the top of the jar. Cover loosely with a clean cloth and set aside for 3 to 7 days. In the summer, fermentation takes place much faster. Taste the pickle after 3 days to check on the sourness. When it is done to your liking, cover the jar with a non-metallic lid and refrigerate. To serve, remove about 1/4 cup per person of the kimchee solids. The liquid is left behind in the jar and may be used to flavour stews and soups. One additional hint: some people find the odour of fermenting cabbage objectionable, so it’s a good idea to find another room to store it until it’s ready to be refrigerated. Yesterday I was invited to photograph a “knitting in public” event. This wasn’t World Wide Knit in Public Day, although it is related to that event, which was held in June, so one could call this a WWKIP+ day. 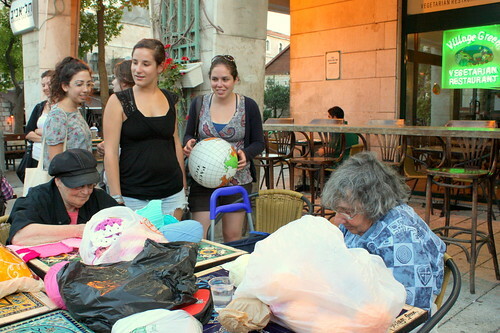 We did part one [of WWKIP] on June 15 in the lobby of Shaare Zedek hospital. However, since our goal was not only to knit in public but to use the event, in my personal case, to thank the hospital for the excellent diagnostic, surgical, and follow-up care that I received there (as did several other participants) and to use WWKIPday to unite fiber fanciers who’d not previously known one another, instead of just accepting the sponsorship of some yarn shop, then sitting outside it, each to knit or crochet “her/his own thing” we joined forces to create squares, then join them into infant carriage blankets and lap robes for cardiac vascular surgery patients who sometimes feel chilly during recovery in the hospital and find the standard quilts provided by the hospital too large and heavy for this task. Since our goal was met beyond our wildest anticipation, we did not complete more than a single blanket that morning. 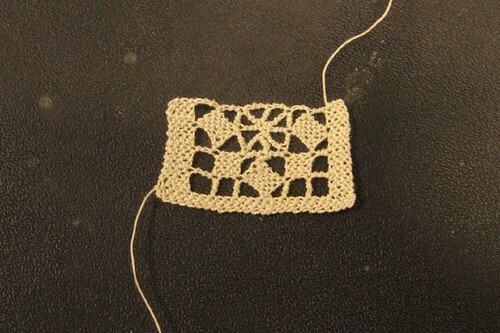 People are still sending in squares–which btw are a great way to make swatches or try a new pattern stitch. So I decided to invite the members of our once per month Tues evening, senior knitters group , friends (like you) and friends of friends to come help us continue this project at our usual venue the Village Green restaurant. Barry, the owner was most supportive. 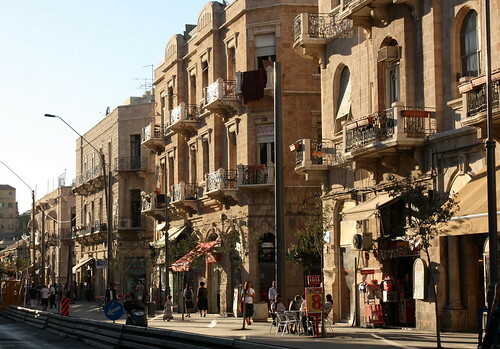 As you know the weather was perfect–a balmy Jerusalem summer evening (between 6 and 8 PM. 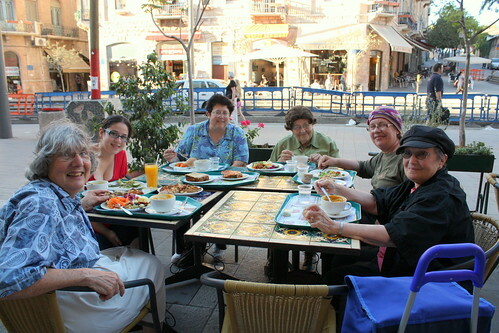 In the photo above are five of the regular “One Tuesday a Month” knitters and Caitlin, Barbara’s Haya’s granddaughter. Barbara is sewing together squares, including the heart motif square that she designed. By the way, I wasn’t a free-loading photographer — I sewed enough squares together to make a baby blanket! It was a lovely, cool evening on Jaffa Road. For an hour and a half, everyone pretty much ignored us at the Village Green restaurant. Then, ten minutes before I was about to leave, a group of high school girls showed up and a couple were interested in joining the effort. One showed off the crocheted flower hair ornament that she’d made. 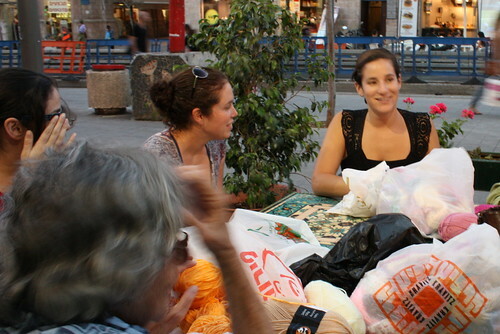 Naama and Yardena returned, sat down at our table, and learned how to sew squares. They are interested attending the next meeting on August 3, to bring their own knitting and ask questions. Today (July 7, 2010), the blanket-sewing effort is continuing at the weekly meeting of the KnN (Knit ‘n Nosh) group in the 60+ club above the Ramot Bet library in Jerusalem. 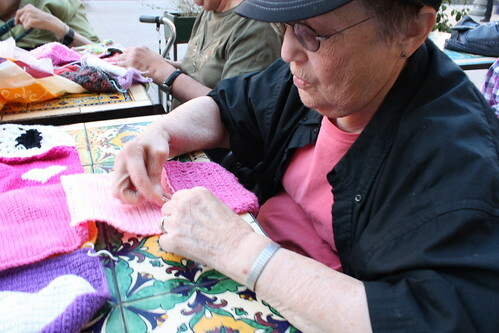 Update: If you are interested in joining the Tuesday evening seniors’ knitting group, get in touch with Ayala Goldberg. I photograph a lot of strangers, although I’m still a bit shy about getting in their face. 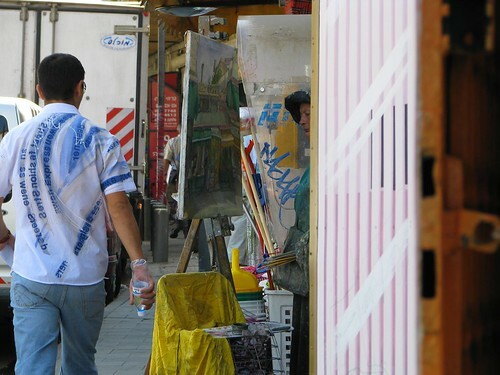 I took these photos of a plein air (literally “in the open” or outdoors) painter in the Mahane Yehuda shuk with a Canon PowerShot S5 on September 22, 2008. I didn’t have a DSLR in those days. In fact, I remember the day very clearly. I had been in the emergency ophthalmology clinic at Hadassah Ein Kerem the night before and was diagnosed with posterior vitreous detachment in the right eye. (PVD is common among people over 65 but it can occur any time if you’re extremely near-sighted.) The following day I was at the company meeting in Binyanei haUma but I was exhausted, barely able to see, and rather depressed about it, so I wandered around the shuk and took a few photos before heading home. But back to the painter…. 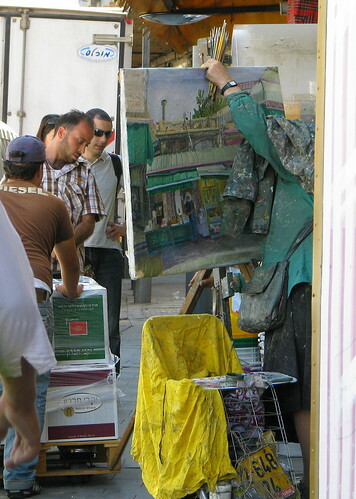 It takes a lot of determination to paint en plein air in a crowded place like the shuk, especially with such a large canvas and easel. 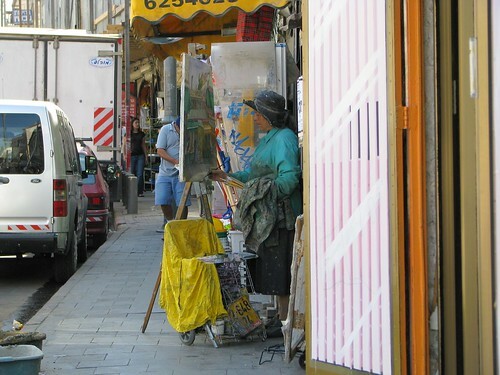 At this point she had to tip the easel to one side in order for a delivery man to pass by with a cart full of boxes. A few days ago I read an announcement in the Jerusalem Post entertainment section of an exhibit of the works of a Jerusalem painter. I was convinced that this painter, Rifkah Goldberg, was the same woman whom I’d photographed because the style of the paintings matched what I recalled from this photo. So I found her email address and sent her the link to my photos. She confirmed that it was she and that this painting is in the exhibit, currently at Jerusalem Artists’ House. The exhibit runs until July 10, 2010 (Sun.-Fri. 9.00-13.00, Sun.-Thurs.16.00-19.00 and Sat. 11.00-14.00). In photo above, my son, Binyamin, with Ivan, his 15-year-old ILAN camper. This is a follow-up posting to my previous entry about the ILAN camp. 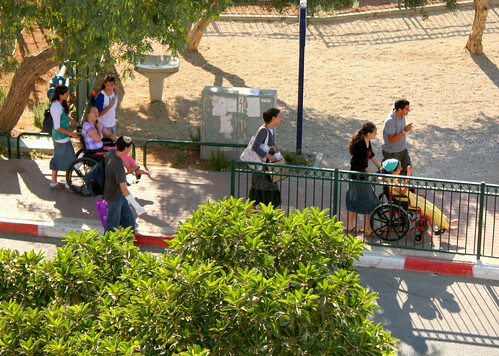 ILAN is Israel’s association for disabled children and teenagers (ILAN site in English). Bnei Akiva is the world’s largest religious Zionist youth movement, with 125,000 members in 37 countries (Wikipedia article, Bnei Akiva in US and Canada). I had thought Bnei Akiva was helping with an ILAN-run camp. It turns out that the Bnei Akiva branch in our neighbourhood, Mitzpeh Nevo, is actually organizing and running this camp. When you consider that these kids are mostly age 10 to 17 (at 18, they go into the army or National Service), it’s pretty impressive. This is the camp’s third year, and the largest so far. The first year they had 10 campers. Last year they had 13. This year they have 25, and each camper has two full-time volunteer counsellors (age 16-17). In addition, the younger children do support work, like bringing food and setting up activities. The campers and counsellors spent the past Shabbat in our neighbourhood. Because Ivan was one of the more mobile campers, he stayed with us. Ivan is 15 years old has a brace on one leg and can’t use his right arm, but he can manage our stairs with crutches and has a wheelchair for outside. He is also mentally handicapped. Although he has trouble expressing himself, we managed in Hebrew. What a lovely boy! He drew pictures for us and was very polite and pleasant to be with. The kids went to prayers and ate at the Pnei Shmuel synagogue Shabbat evening (it was renovated a few years ago so that it is fully wheelchair-accessible). In the morning they had prayers and kiddush at the Gilgal synagogue (a new building, accessible). Ivan ate lunch with us. In the afternoon Bnei Akiv held their “mifkad” (assembly) in front of the Pnei Shmuel synagogue, on the road in front of our apartment building. It was very impressive to see over 100 Bnei Akiva kids singing and clapping in a circle, with the 25 or so ILAN kids among them. Afterwards they ate seudah shlishit (“third meal” of Shabbat) in the Pnei Shmuel hall. 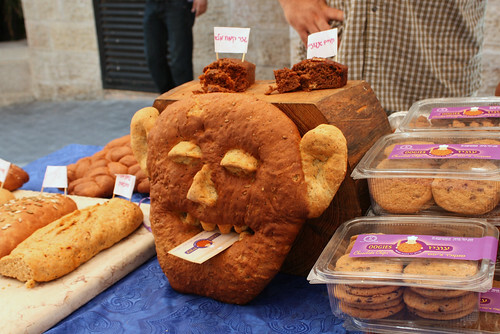 The Bnei Akiva kids have been raising money for months. The girls have been baking cakes and selling them. My son and his friends have been putting on their uniforms and dancing in downtown Jerusalem in all weather (mainly hot) for the past few Fridays to collect money from tourists and shoppers. All I can say is that I am very proud of my son and so impressed that these kids are doing this. Someone said to me this morning that, in Israel, Bnei Akiva kids are considered almost as adults, and they act accordingly. 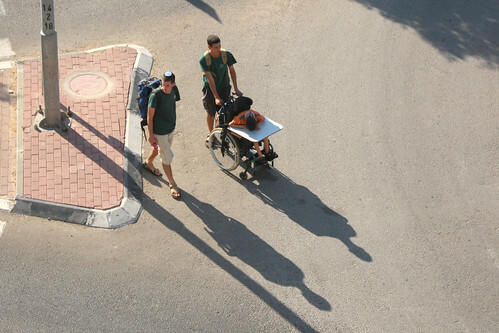 In photo above: Amichai, Benjy, and Yuval. I took this photo from the front balcony. I liked the shadows. This Shabbat two busloads of ILAN campers and their volunteer companions (two per camper) are staying in our neighbourhood. 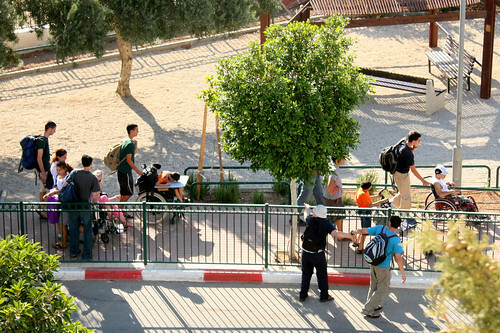 ILAN is Israel’s foundation for physically disabled children (more info here). My son is volunteering with the camp for a week. I just found out a few hours ago that the boy that he is accompanying needs a place to stay, so he will be with us. Ivan is 15 years old and originally from Russia. Since he walks with crutches, he was able to manage our stairs. Binyamin, my son, is 16. He seems to be very good at helping Ivan manage the toilet and shower. At the moment they’re hanging out in the kitchen, drinking tea and chatting. This evening the campers and volunteers will be eating in the Bnei Akiva building. Binyamin and Ivan will be sleeping in our spare bedroom and eating lunch with us tomorrow. Ivan doesn’t speak English but he speaks reasonable Hebrew, so we’ll manage!